If you are looking for information on the Smartbox franchise business opportunity, Smartbox storage franchises or Smartbox franchising, then you have come to the right place. 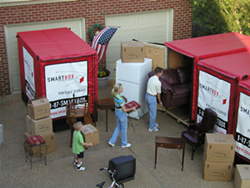 SMARTBOX makes the lives of the 100 million Americans who move or store easier by bringing storage right to their door and moving it conveniently, thus alleviating the time, cost, and hassle usually associated with moving and storing. SMARTBOX has created all the tools necessary for you to take part in the evolution of an industry. Consumers demand convenience. Just look at the microwave oven, GPS services, the Internet, and now portable storage. Customers have many more appealing things to do with their time than deal with the traditional, time-consuming, labor-intensive process of moving. SMARTBOX makes this process easier by delivering portable storage to a customer's door. Once filled, boxes are then picked-up and transported to the storage center and retrieved at the customer's request and delivered to their door. After President and CEO Mike Lowe moved for the 12th time in 20 years, he figured there had to be a better way than renting a truck, packing and unpacking, loading and unloading, and then returning the truck within 24 hours. As a result, he assembled a group of dedicated, entrepreneurial, customer service driven individuals, with a reputation of unprecedented operational excellence to make his vision a reality. Our commitment to excellence extends to our franchise support system in the same way that it works for our purchasing, promotion, product development, and merchandising systems. You will be in business for yourself but not by yourself! Getting started is easy. Within 90 to 120 days of reading this, you could begin running your very own SMARTBOX franchise. Strike while the iron is hot and take advantage of a unique opportunity that is changing the way people move and store their belongings. Become a SMARTBOX portable self storage owner, and you will be on the cutting edge of a brand new industry whose time has arrived. SMARTBOX seeks professional business owners and managers who are results-oriented and have previous sales and marketing experience. SMARTBOX franchisees may be active in the operations or choose to professionally manage the business. Either way, franchise owners are characterized by a strong desire to succeed in business by helping us to exceed the expectations of every SMARTBOX customer. And, finally, we also are looking for people who have the necessary financial resources to effectively develop the franchise territory. If you have an entrepreneurial spirit, want to own your own business and recognize yourself in these descriptions, SMARTBOX is the right opportunity for you.